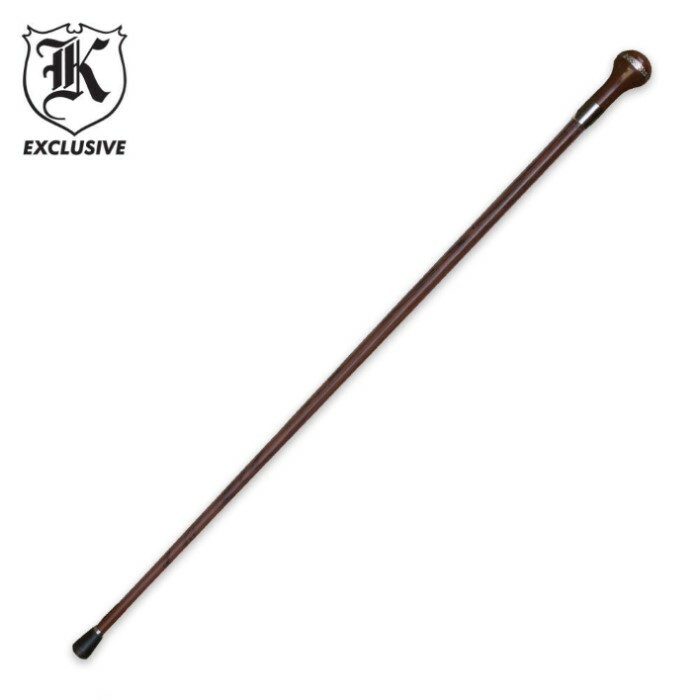 Plain old canes get really boring, but this sleek sword cane is anything but boring. Its dark construction is built formally stylish while housing a blade in secret. A palm-sized cane head features an intricately detailed stainless wrap that when twisted unveils a 12 1/2 in. antiqued stainless steel sword blade. A removable rubber cane foot can be taken off to display a more stylish stainless tip when used for show instead of walking stability. 36 1/2 in. overall. meh quality overall but for the under $20 price range, impressive. blade is a bit short to be called a "sword", though. The one we got was sharp. I mean really sharp. The blade is a good length and a nice conversation piece, but if you want to use it as a defensive weapon, don't waste the time trying to unscrew it. It's too loud, and obvious. Your best bet would be to use the thing like a club or to block. The body is metal, and supports a VERY hefty weight. We gave ours to Grand Dad, and he loves showing it off to friends and neighbours. Of course, he has a small collection of authentic Hungarian Axe Canes, so something just a touch more everyday was right up his alley. Purchased this as well as the Black Tie sword cane. Both are very well made - sturdy and elegant. As this would be a "last ditch" self defense weapon, the blade is long enough for me as it would be a great stabbing weapon, not a dueling sword. For the reviewer asking for a black color cane, the Black Tie sword cane available here is essentially the same cane as the Midnight Debonair, only it's black. As a Cane user, I ordered this particular item for the "hidden" self-protection devise cleverly concealed in the handle. The cane itself has a good heavy weight to it, which can route a would be thug when applied to the head. The only draw back I find is the blade is really too short. I would appreciate a longer blade, and a quicker release method because when you're in trouble, trouble might not wait until you "un-screw" the handle to expose the dagger. 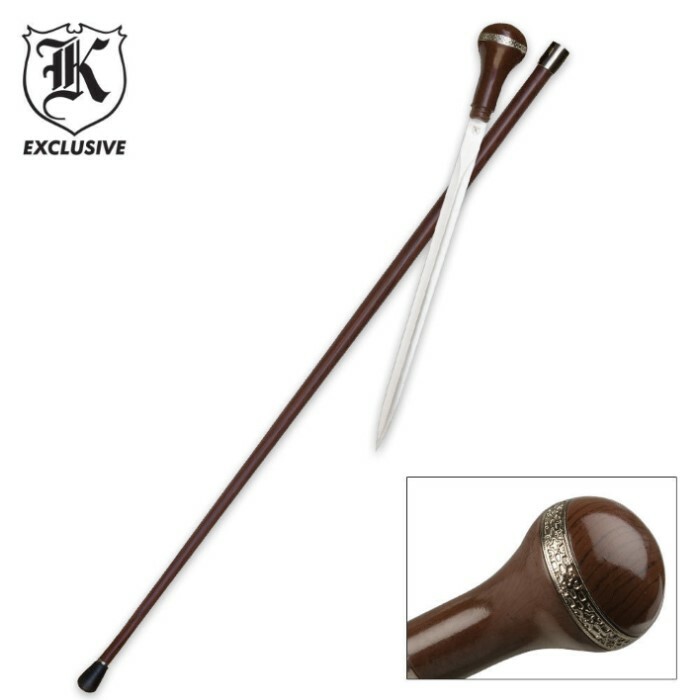 I rate this with 5 stars, and suggest someone with authority to recommend manufacturing a black color cane also - because I would then order another one. Excellent item! The best I've ever bought from here! Unfortunately, the description isn't entirely accurate: The cane is only patterned to LOOK like wood. It is actually metal, and is hefty enough to make a good cudgel. The blade isn't particularly sharp. In fact, the edge is so dull you couldn't cut yourself on it if you tried, but the tip is another story, and it would be perfect for thrusting in self defense.